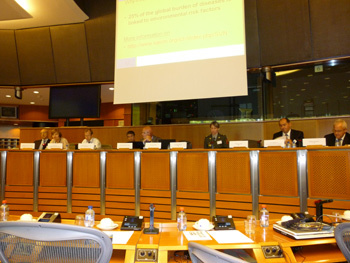 Mini-Hearing on Obsolete Pesticides in Eastern European Countries, the Caucasus and Central Asian countries were organized 29.06.10 in European Parliament by Mr. John Vijgen the Director of the International HCH & Pesticides Association (IHPA) to draw international attention on the world-wide problem s related the obsolete pesticides storage, treatment , disposal and its dangers for human health and the environment. On the agenda the urgent case from Armenia was presented by ambassador of OSCE in Armenia Sergey P. Kapinos with demonstration of the film. 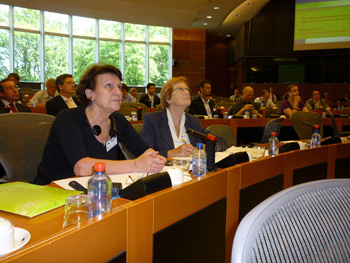 Two more cases were presented from Azerbaijan and Moldova. Speakers from EU Parliament and EU commission introduced the strategies and concrete steps for implementation of Action Plan on Elimination of POPs, how to integrate this problem in wide EU program like Neighbourhood programme Project. Slovenian Speaker introduced the example on the cooperation, preparation of the strategy, common use of financial sources biletarel and multilateral cooperation established among Danube countries, how OP issue were integrated in common strategy programme. All speakers underlined the idea that the issue of obsolete pesticide should be prioritized in the national development plans. After presentations the questions and discussion were suggested by chair. Dr. Elena Manvelyan head of AWHHE had an intervention highlighting the situation with OP burial ground in Armenia and the last information concerning the monotoring of the site. The short estimation of the emergency situation of Armenian case was done and recommentations related to the next steps of Action Plan were suggested by AWHHE. The cases presented by countries has created the basis for a joint and supported international platform to prepare specific action programs to support the countries of EECCA. Dear members of EU Parliament, the European Commission and representatives of the international organizations! I am Elena Manvelyan, president of the NGO Armenian Women for Health and Healthy Environment, short AWHHE. Let me present to you a brief information on our role as a civil society organization in discovering and assessing the serious problem of the toxic burial ground in Armenia. And then I would like to ask you four questions. AWHHE as a women’s environmental health organization is working for sustainable development, protection of human health and the environment in Armenia. Among the activities of our NGO the hazardous waste management is the most important one. Since we discovered the huge pesticides burial site in 2000, we have been monitoring the situation, and informed the governmental bodies and interested stakeholders about the results of our investigations. The problem of the burial ground has been in the centre of our attention for about for 10 years on end. During this period of time AWHHE did the sampling of soil, vegetations, water, breast milk and cow milk. The results have pointed to high and increasing concentrations of DDT and its metabolites as well as HCH in soil samples. The analyses were done by a certificated laboratory in Yerevan. The geological investigation on the landslide movement was carried out for our NGO by Geological Institute of the National Academy of Science. Most of these research results were alarming and were brought several times to the attention of the Armenian Government and the mass media. We did a lot of awareness rising. In 2004, 2005 the Government undertook the temporary protective measures but they did not succeed to protect the local population and the environment from the high risks of the sliding toxic burial. AWHHE brought this emergency situation issue to the attention of international organizations such as OSCE, UNEP, FAO, IPHA being supported by large international NGO networks as International POPs Elimination Network /IPEN/ and Women in Europe for a Common Future /WECF/. We are very happy that the European Parliament has put this emergency case on their agenda and we are grateful to Mr. John Vijgen for his strong initiative to discuss the possible action to be taken by EU and the international community support. I would like to give some more information from our last monitoring visit to the burial site a few days ago. As you heard from Mr. Capinos and Mr. John Vijgen whom we accompanied to the burial site two months ago the disastrous events happened this year. Though the Government has covered the opened burial ground with new protective layer we found out a week ago that still there is smelling around the burial. Specially it smells around the swampy areas below the burial. This is a sign that pollution has invaded the surrounding area already. Though almost 3 months have passed we still have no precise data about the levels of pollution and the magnitude of polluted area. There are a few official data of 4 samples which were analyzed by the Centre for Ecological-Noosphere Studies. We are loosing the time as according to the different experts the levels of pollution were alarming. May be officials were careful in order to avoid the panic among the local population. • How and by whom the risks to agriculture will be assessed as the distance of the burial ground is only 25 km far from the main agricultural region Ararat valley. The water pollution from the burial may reach the river Hrazdan which feeds the river that irrigates this valley. • Can the EU play a role in enabling NGO, to continue and strengthen its role as a watch dog but also a good partner in finding the best solution and achieving public support.